Holiday Greetings 2014 - 2015: Climb, Trek and Sherpa Charity Support. Greetings , from friendly - sunny Nepal. I am Dan Mazur, a 14 year leader for SummitClimb and SummitTrek. I have luckily led 9 succesful Everest expeditions to the summit, along with fun basecamp treks (including Christmas and New Year), Everest Training Climbs, summit climbs to Cho Oyu (5 times), Ama Dablam (5 times), Baruntse (4 times), Mera Peak, (6 times), and Island Peak (7 times). I support Sherpa charity treks to build hospitals, schools, environmental and cultural projects with the Mount Everest Foundation for Sustainable Development. I am proud to work where they encourage new climbers and trekkers via free of cost glacier schools, and where a priority is developing new leaders through leader-in-training programs. Welcoming men and women of all ages and nationalities to join our teams! 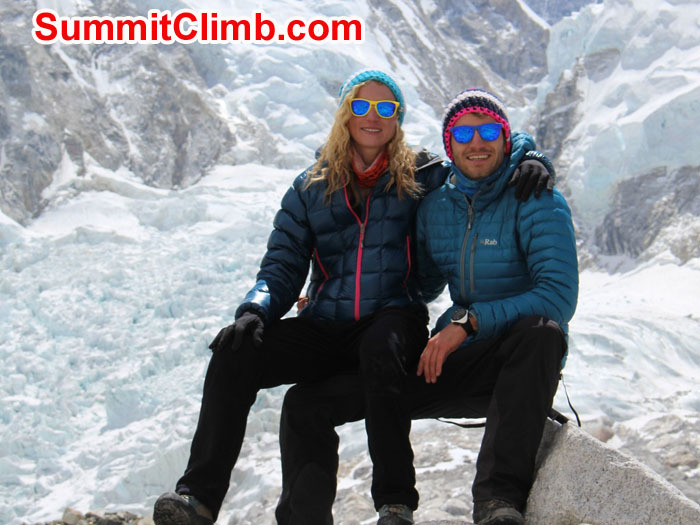 This newsletter introduces 2015 trips to Everest and beyond, and our 2014 Christmas and New Year plans for climbing and trekking the big mountains, and giving back to the climbing community with free of cost no-charge offerings and Sherpa charity support work. Please contact me now at email: DanielMazur@SummitClimb.com , tel UK: +44 (0) 7810375400, tel USA: +1-360-570-0715, skype: dan.mazur88488, www.facebook.com/DanielLeeMazur , twitter: @DanielMazur , www.linkedin.com/in/danielmazur . 1. Mountain News: Tuesday, 18 November, 2014. Well. It's been a lucky year for us. 2. Sherpa News: Let's face it, 2014 was not good for the Sherpas. 3. Attend or host an Himalayan evening this Winter. 4. Encouraging new climbers and trekkers to join us. free of cost no-charge week long glacier climbing schools. 5. You are welcome to become a member of our upcoming trips. 6. All prices frozen at 2012 levels. Join in 2014, before the price increases. 7. We pay you cash for sending us your friends and colleagues to join our trips. 8. We take good care of our former members: Were you a member of our 2014 Nepal climbing team? Free 2015 permit. 10. All expeditions have a SummitClimb veteran British, American, European, or Australian leader. 11. Are you or a friend interested in becoming a mountain leader? 12. Our trips are staffed by friendly, strong, experienced , well-trained Sherpas. 13. Our cooks are experts at preparing delicious food for a wide variety of tastes. 14. We have very good equipment on our trips. 15. We have our own expedition weather forecasting systems and our leaders are weather experts. 16. Our expedition communications are top flight. We offer free internet service to our members in basecamp. 17. We provide an equipment purchase and rent/hire service for free ideas of where to find the best climbing equipment. 18. We offer free oxygen on all of our Everest and Lhotse climbs. 19. All of our trips feature 4 free hotel nights in Kathmandu, 2 nights at the beginning of the trip and 2 at the end. 20. New extended date option on all of our trips. Now all of our trips are available for flexible date bookings. 21. What people are saying: Recently I was pleased to bump into one of our former members in the street here in Kathmandu. 22. About 80% of our members join as individuals, we also have couples and small groups of 2-3 friends join in the fun. 23. Also, we encourage larger private groups and we are able to provide a private, separate cook, guides, leader, Sherpas. 24. Announcing our new partner site: www.ClimbandTrek.com . If you have a moment, please check out the site. 25. SummitClimb and SummitTrek social media in the news. 26. On other new trip developments, we offer a revamped Mustagata, Elbrus, and Africa program. 27. CHRISTMAS AND NEW YEAR TREKKING TO EVEREST BASE CAMP. 18 days. www.ChristmasNewYearTrek.com . 28. WINTER GLACIER SCHOOL 1 - 7 JANUARY, 2015. glacier travel, ice climbing, with Dan Mazur. Free, no charge. www.WinterGlacierSchool.org . 29. THREE ACONCAGUA CLIMBS TAKING PLACE IN December, January, and February. Leader Max Kausch. www.AconcaguaSummitClimb.com . 30. EVEREST NEPAL SUMMIT CLIMB. April-June or September-October, with 9 time summit leader Dan Mazur. www.EverestNepalExpedition.com . 31. EVEREST TRAINING CLIMB CAMP 3 NEPAL. April or May. 31 day or 16 day option, with 9 time summit leader Dan Mazur. www.EverestNepalTrainingClimb.com . 32. EVEREST TIBET SUMMIT CLIMB. April-June, with 4 time summit leader David Obrien. www.EverestTibet.com . 33. EVEREST TIBET TRAINING CLIMB NORTH-COL. April or May, with 4 time summit leader David Obrien. www.EverestTrainingClimbTibet.com . 34. CHO OYU EXPEDITION. April-May, & August-September. 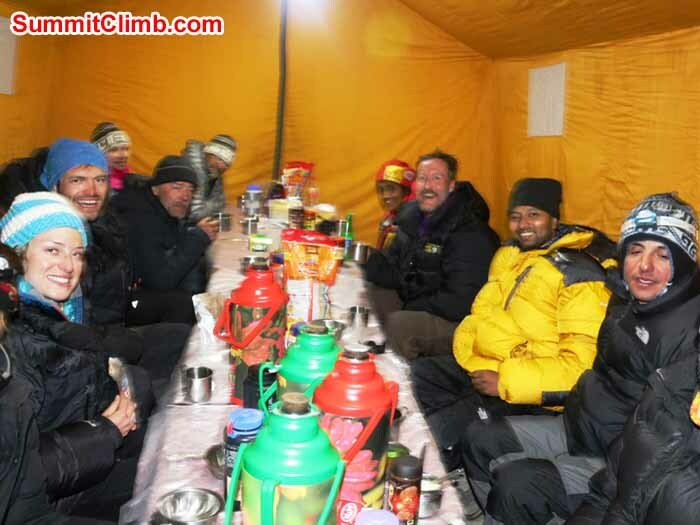 Leaders Angel Armesto & 5 time Cho Oyu summiter Dan Mazur. www.ExpeditionChoOyu.com . 35. MOUNT LHOTSE EXPEDITION. April-May, Leader 4 time Lhotse summiter Dan Mazur: www.LhotseExpedition.com . 36. EVEREST GLACIER SCHOOL:. April, May, October, or November. 22 days or Seven day option. Leader AngSange Sherpa www.EverestGlacierSchool.com . 37. ISLAND TREKKING PEAK EXPEDITION. 22 days or 5 days (climb only) in April, May, October or November: Leader Dan Mazur. www.IslandPeakClimb.com . 38. EVEREST BASECAMP WALK NEPAL. 18 days in April, May, October or November. Leader Dan Mazur www.EverestBasecampWalk.com . 39. EVEREST TIBET ADVANCED BASECAMP WALK. April or May. Leader David Obrien. www.AdvancedBasecampWalk.com . 40. KILIMANJARO / MT KENYA / SAFARI. Available throughout the year. www.AfricaSummitClimb.com . 41. REMOTE NEPAL CHARITY SERVICE TREK: 12 Days in June or November. Leader Dan Mazur. www.RemoteNepalServiceTrek.org . 42. MOUNT MUSTAGATA EXPEDITION. 25 days in July. Leader Julian Bierman. www.MustagataClimb.com . 43. MOUNT ELBRUS: 9 days in June, July, and August. Leader Dan Mazur. www.ElbrusSummitClimb.com . 44. FREE-OF-COST NO-CHARGE SUMMER GLACIER SCHOOL. 20-27 June. Leader Dan Mazur. www.CascadeGlacierSchool.org . 45. CHO OYU EXPEDITION. August-September & April-May. Leaders 5 time Cho Oyu summiter Dan Mazur & Angel Armesto. www.ExpeditionChoOyu.com . 46. AMA DABLAM, ASIA'S MOST FAMOUS ROCK, SNOW, AND ICE PEAK. October and November. Leader Dani Fuller. www.ExpeditionAmaDablam.com . 47. MOUNT BARUNTSE EXPEDITION. 32 days in October-November. Leader Dan Mazur. www.BaruntseClimb.com . 48. MERA PEAK, REMOTE TREKKING PEAK, HIGHEST IN NEPAL. 21 Days in October - November. Leader Dan Mazur. www.MeraPeakClimb.com . 1. Mountain News: Tuesday, 18 November, 2014. Well. It's been a lucky year for us. 100% of our members summited Everest in May. Our strong Sherpas and leadership team even put the first Finnish woman on the summit. Our Everest training climb team went to great heights of learning. Both our Cho Oyu teams summited the world's 6th highest and most accessible 8000 metre / 26,000 foot mountain in 2014. Our Ama Dablam teams summited Asia's most famous rock, ice, and snow peak, moderately technical but very climbable. Our Baruntse and Mera Peak teams summited, completing the Everest region's most remote grand circle traverse, once again becoming the first of the season to summit Baruntse, Nepal's easiest 7000 metre / 23,000 foot peak, with something for everyone, novices and experts alike. We put numerous members atop Island Peak, Nepal's most famous "trekking peak". Our Aconcagua teams reached the top of South America's 7-summit, and we had our first annual Christmas and New Year Basecamp Trek, looking forward to an exciting repeat this year. Our Africa Kilimanjaro trekking and Mt. Kenya rock climbing trips are increasingly popular and succesful too. For more news please visit www.SummitClimbNews.com and www.SummitTrekNews.com . 2. Sherpa News: Let's face it, 2014 was not good for the Sherpas. On 18 April at 6:30 am, 17 Sherpas were killed by falling ice just below camp 1 on Everest, while they were sitting on their rucksacks. It was a horrible tragedy, and although none of SummitClimb's Sherpas were affected, we have decided it is our duty to help. We encourage cash donations to families of the lost Sherpas, and we are working with the Everest Foundation to give back to Sherpa communities. There is a new health project, thanks to Shelley Bloom, to eradicate stomach parasites in villages near to Mt. Everest but which never benefited from visits by Sir Edmund Hillary nor Tenzing Norgay Sherpa. We are pushing for quality education at Charmading High School with 650 students and where the new computer room and library are almost finished, thanks to Markus Staehelin. We are developing an human waste treatment plant for Everest basecamp, thanks to Garry Porter and Nate Janega. We are rebuilding the closest Buddhist women's convent to Mt. Everest, thanks to Marcia Macdonald, at the Deboche Nunnery, sorely neglected since 1928. Through the Sherpa Training School, we train Sherpas to become qualified climbers, guides and cooks, thanks to Len Thomas. We also want to thank generous sponsors who provided kind donations of climbing gear, clothing, boots, crampons, harnesses, rucksacks and funds for the Sherpa Climbing School. Please keep your climbing equipment, clothing, boot, and sleeping bag donations coming and contact: info@MountEverestFoundation.org . For Sherpa charity news please visit www.MEFSDNews.org . Sherpas, climbers, media & government attend the wake meeting in ABC. Photo by Mike Fairman. South Col route taken from above Pomori ABC. Photo by Patrick McKnight. 3. Attend or host an Himalayan evening this Winter. Our next planned presentation is in Bristol in January and February. Be there! Our leaders give exciting and informative Himalayan climbing, trekking and Sherpa charity fund raising lectures all year long. If you know of any possible venue or audience where we might present a thrilling live multi-media mountain slide video show, please let us know. We are always ready to meet new groups of excited mountain enthusiasts. 4. Encouraging new climbers and trekkers to join us. We conduct constant free of cost no-charge week long glacier climbing schools throughout the year, and our next one is the Winter glacier school 1-7 January. Please join in! 5. You are welcome to become a member of our upcoming trips. Our offerings are widely varied and we pride ourselves on providing climbing and trekking for everyone. 6. All prices frozen at 2012 levels. We vowed not to increase our prices during 2014. That means if you book a 2015 trip during 2014, you will still pay the old 2012 price. Why are our trips so affordable? Our company is run by climbers and trekkers, for climbers and trekkers. We never charge more than we would be willing to pay ourselves. We give discounts for groups of 2 or more, returning members, mountain guides, and medical practitioners. We support people who wish to become a leader in training. 7. We pay you cash for sending us your friends and colleagues to join our trips. Each year we pay out many "finder's fees" and commissions when you send us team members. Take your payment in cash, cheque, or a credit on a trip price reduction. 8. We take good care of our former members: If you were a member of our 2014 Nepal climbing teams please check in to receive your free 2015 permit and special cost reductions for unused oxygen and unpaid Sherpa high-altitude bonuses on the Everest Nepal summit climb, Everest Nepal training climb, and Lhotse summit climb. By the way, this offer is time limited and only available for the 2015 season, it is not available in 2016 or later. Welcome to our 2015 Everest climbing season! David Maidment on top. Photo by Elmo Francis. Jangbu, Dan and Elmo holding Nandini Chol Raj's Airtel flag in front of Everest, Nuptse, and Makalu. Photo b David Maidment. Toy on the Ice Axe. Photo Scot Younghusband. Sam & Alex in front of Icefall. Photo by Sam Chappatte. 10. All expeditions have a very experienced well organized SummitClimb veteran British, American, European, or Australian leader. We develop our leaders slowly and carefully over time. Our leaders are all past team members of SummitClimb and SummitTrek trips, so they know how we do things, and understand our emphasis on high quality service. 11. Are you or a friend interested in becoming a mountain leader? Our growing company is always looking for trekking and climbing members who would like to learn to become leaders, so please visit www.LeaderInTraining.com , where we give special discounts for learning leaders and mountain guides. If you are already a mountain guide, please do ask about the special guide's discount. Thank you very much. 12. All of our trips are staffed by friendly, strong, experienced, well-trained Sherpas, who are the best because we care about them. They have all summited Everest numerous times, some more than 10, and are paid fairly, tipped well, and are not overworked. They have all insurance and employee benefits. We pay for our Sherpa's children to go to school. Our Sherpas are loyal, friendly, and hard working. Our Sherpas receive regular training and attend English classes. You won't see our Sherpas having a labor dispute or going on "strike". We believe being a climbing or trekking Sherpa is an honourable job, and we treat them with respect. 13. Our cooks are experts at preparing delicious food for a wide variety of tastes. Do you like appetizing meals with a wide range of different types of main courses, salads, and delicious desserts? We provide three hearty meals each day made from fresh local ingredients. Our cooks have been trained in 5 star hotels and can cook for European, American, British, South Asian, Chinese, and many other palettes. You can count on excellent food on trek, in basecamp and during the climb. We even have three meals each day in our high camps, all of the way up to the top, including summit day! 14. We have very good equipment on our trips. We include excellent quality sleeping tents (a single tent for each member in basecamp). We have comfortable warm dining tents with tables and chairs, carpeting, and heaters. Our kitchen tents are very clean and well stocked. Our toilet tents and hot shower tents are immaculate. We check all of the climbing material very carefully, including ropes, anchors, walkie talkies, high altitude tents, high altitude stoves and fuel. 15. We have our own expedition weather forecasting systems and our leaders are weather experts. We use a combination of Swiss, Norwegian, Austrian, American, British, Chinese, Indian, and Nepalese weather forecasting tools. A happy Adi Koszta and Thomas Van Dantzig at north Col, Everest Tibet - Photo Scott patch. Team in our comfortable dining tent in Everest basecamp, left to right - Christie, Alexandra, Sam, Ed, Paula, Mike, Nandini, Pat, Elmo, Carlos, Mike. Photo by Pasang. We believe our weather forecaasts are among the best and we share them with other teams to compare notes and be sure all of us are in agreement about what the weather might have in store for us. 16. Our expedition communications are top flight. We offer free internet service to our members in basecamp. Update your facebook, send and receive emails, and make skype calls from basecamp for no charge. We also offer international calls at a discounted rate (just a few cents per minute). We have walkie-talkie 2 way radios and we also have satellite telephones for your safety and convenience. All of our expeditions offer a news page with daily updates so your family and friends at home can stay apprised of your team's progress during the climb or trek. Please check www.SummitClimbNews.com to see examples of previous team's news pages. 17. We provide an equipment purchase and rent/hire service for free ideas of where to find the best climbing equipment, clothing, shoes, sleeping bags, etcetera for your expedition. Give us a call or email and we will be glad to help. Equipment purchase and hire/renting is simple, easy and affordable here in Kathmandu! We have access to the finest brands and the best quality gear at rock bottom prices. Also, we provide personal gear checking of all of your equipment in Kathmandu. Please bring the gear you have and we will check it and help you find any missing pieces, make sure it fits correctly, and is the best quality for you. Even if you have no gear, please just let us know and we will find every single piece for you. With more than 100 high quality and affordable equipment shops here in Kathmandu, we can find any item you might need. Just let us know your sizes in advance and we will give you a list of options, and assure you of availability. 18. We offer free oxygen on all of our Everest and Lhotse climbs. That's right free oxygen. We include a 5 bottle set of state-of-the-art Poisk oxygen, with the latest regulators and oxygen masks. All of our oxygen systems are safety checked each season by Russian technicians who work for the manufacturer. We offer low priced oxygen systems on Cho Oyu with an "equipment buy back" for oxygen sets returned in used but good conditon, so its as if you rented your oxygen gear. 19. All of our trips feature 4 free hotel nights in Kathmandu, 2 nights at the beginning of the trip and 2 at the end, at the comfortable three star Hotel Shakti. Its an excellent and classic hotel surrounded by green gardens and located in the heart of the city action near many delicious restaurants, the city's best mountain equipment shopping, and abundant nightlife all within a few minutes walk. The Shakti also offers lots of entertaining day trip (and night outing) options such as wild game safaris, horse back riding, art classes, mountain biking, volunteer opportunities at orphanages, hospitals, schools, women's centres, rock climbing, bird watching, cooking classes, sport fishing, day peak climbing, herbal medicine seminars, day hikes, pottery classes, car tours, sightseeing, temple tours, henna handpainting classes, city tours, massage, swimming, beauty salon, motorbiking, yoga retreats, river rafting, painting classes, golf, language courses, kayaking, writing seminars, bungie jumping, religious worship, canyoning, hot tubs, health club, saunas, fitness center, spa treatments, Mount Kailash Treks, night clubs, meditation retreats, gourmet restaurants, cultural dance performances, wine tasting, pedicures and manicures, casino gambling, barber shop, discotheques, airport transfers, Scenic flights around Mount Everest and much much more. 20. New extended date option on all of our trips. Now all of our trips are available for flexible date bookings. We still have the "fixed dates" for the trip, which is the established group you can join on pre-arranged dates chosen by the organizers. Whats new is: now you can choose your own dates within the date range (usually a 2 month period) and you can show up any time you like during those dates. Thus we are encouraging people to join us who previously could not due to date limitations. We are offering more flexibility in our schedules to encourage you to join us, whether you want go on our fixed dates, or choose your own. 21. What people are saying: Recently I was pleased to bump into one of our former members in the street here in Kathmandu in front one of our favorite climbing and trekking shops. He is JP from London and he just returned from climbing with our SummitClimb team on www.AmaDablamClimb.com . Here is what he had to say: "At first I was a bit nervous to join a team of people who I did not know. By day three of the trek, all of us were gelling well into a group. The British leader was excellent and made some really good decisions which helped the team a lot and his wealth of experience showed. I was impressed with all of the things which SummitClimb included for free, like pro Sherpas, hotels, delicious food, comfortable single tents, an exclellent basecamp, hot showers, satellite phones, good rope fixing, quality high altitude camps. All of these came as standard equipment for the one low price. When we reached the mountain and saw what other teams did or did not have, then we knew we had made the right choice with SummitClimb." (November 14th conversation at Hotel Shakti, Kathmandu). 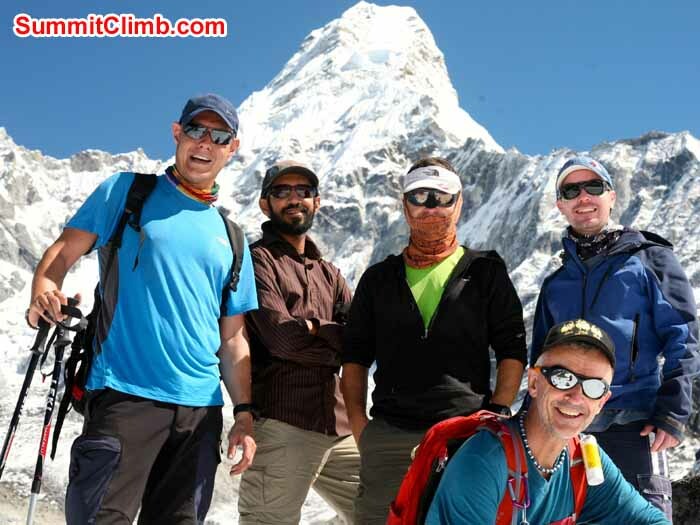 Group Photos from AmaDablam climber, Island Peak and EBC members. Photo Angela. View just below walking down from Namche. Photo Angela. 23. We encourage larger private groups and are able to provide a private, separate cook, guides, leader, Sherpas, dining tent, showers, toilets, high altitude tents and equipment, just for your own private group. Did you know we can offer a free personal sherpa for every three full service members? 24. Announcing our new partner site: www.ClimbandTrek.com . We are excited to tie up this new web relationship. If you have a moment, please check out the site and send your comments. We could use your feedback and creative criticism. 25. SummitClimb and SummitTrek social media in the news. We have gone over to twitter for our news updates. What do you think? Thanks to almost daily news updates our facebook friends hit 18,000 last week and we are planning a gear give away when we hit 20,000, so come on and join the fun and tell your friends. 26. We are offering a revamped Mustagata, Elbrus, and Africa program, thanks to a new partnership with a group of German friends. We are excited to relaunch these thrilling trips, so please check out the new changes. Murari at Kalapathar. Photo Murari. 28. Winter Glacier School: 1 - 7 January, 2015. snow camping and skills, glacier travel, ice climbing, with Daniel Mazur. Class begins at SummitClimb leader Dan Mazur's home near Seattle, where Dan will check your gear personally. Then we head up to Seattle to explore the least expensive options for purchasing and renting/hiring the equipment you need. Following that, we stop at a local grocery store to stock up on food for the week long trip, then we car pool to the mountain where we purchase our $50 clmbing permits and walk for 1 hour to some low angle snow fields where we practice snow walking, sliding, and glissading technique. After walking for 1 more hour, we set up camp on the glacier, cook a delicious meal and head for bed. The following day we train on snow and ice and glaciers using ropes, ice axes, crampons, ascending devices, descending devices, etcetera. Next day we climb high on the mountain and set up camp near a large crevasse field. The following day we practice climbing in and out of the beautiful blue crevasses and that night we head to the 4,000 metre / 14,000 foot high summit of this stunning glacier volcano, with amazing views of Seattle and the Pacific ocean. after our summit photo, we descend all the way back to the car park and return to Dan's house near Seattle. All that in just a week, and for FREE. Welcome to our Glacier School ! James & Allan on the way down - Photo: Max Kausch. Enjoying the beautiful day. Mike and George on the summit at 6962m - Photo Mike Fairman. Group Dinner. 29. THREE ACONCAGUA CLIMBS TAKING PLACE IN December, January, and February. 18 December to 6 January (20 days) 11-30 January (20 days) or 2 to 21 February (20 days). We also offer the opportunity to climb the Polish Direct Route , 2 to 24 February (23 days). MOUNT ACONCAGUA CLIMBS TO THE HIGHEST PEAK IN ALL OF THE AMERICAS and a famous Seven Summit. 20 or 23 days in Argentina climbing a very easy and very high mountain. 6980 metres / 23,000 feet high and excellent preparation for Everest. Patient, friendly leader Max Kausch teaches everything you need to know and has been the chief of 20 expeditions for Summit Climb. Cost: $3750, £2260, €2735. www.AconcaguaSummitClimb.com . 31. EVEREST TRAINING CLIMB CAMP 3 NEPAL. April or May, 2015 and 2016. Learn all of the skills you need to climb Everest during the 31 day (or streamlined 16 day option) www.EverestNepalTrainingClimb.com . We trek into base, acclimatize slowly and cautiously through the Khumbu icefall and Western Cwm, then carefully move our way up the mountain all the way to camp 3 at 7300 metres / 23,000 feet. Many members will choose to go back home at this point, but some will choose to continue to the summit and join the www.EverestNepalClimb.com . Leader Dan Mazur is very friendly and an excellent teacher, his training climbs are always succesful, safe and fun. We offer two climbs, one beginning on 7 April and another on 21 April. Choose our fixed dates or New Flexible Date Option: arrive anytime at your convenience during April and May. Full Service Cost: $8,650, £5,650, €6650. Sixteen day option : $6350, £4150, €4850. 32. EVEREST TIBET SUMMIT CLIMB. April-June, 2015 and 2016. 60 days. www.EverestTibet.com Climb the world's highest peak made famous by Mallory and Irvine in 1924. Leader David Obrien is very experienced, friendly and well organised, having led 4 Everest expeditions. The Tibet side of Everest is less expensive, more remote and less crowded than the Nepal side. Climbing the Tibet side of Everest is cheaper, but reputed to be colder and windier than the Nepal side. Full Service Cost: $28,450, £18,750, €21,750; Basic Climb Cost: $9950, £6550, €7550. 100% of our team reached the summit in 2014, with the first Finnish woman on the summit. View the latest news at: www.EverestTibetNews.com . Choose our fixed dates beginning on 7 April, or New Felixible Date Option: arrive anytime at your convenience during April and May. 33. EVEREST TIBET TRAINING CLIMB NORTH-COL. April or May, 2015 and 2016. Learn everything you need to know to climb Everest in 28 days. Probably the world's easiest 7000 metre/ 23,000 foot high peak located on the shoulder of Everest in exotic Tibet. A great way to see how you feel at altitude in a short amount of time. David Obrien is a very experienced and friendly leader who teaches you everything you need to know. If you feel well on the April trip, you can transition to Everest or Cho Oyu. We offer two climbs, one beginning on 7 April and another on 21 April. Choose our fixed dates or New Flexible Date Option: arrive anytime at your convenience during April and May. Full Service Cost: $7,950, £4,950, €6350. www.EverestTrainingClimbTibet.com . 34. MOUNT CHO OYU EXPEDITION. www.ExpeditionChoOyu.com April-May, and August-September 2015 and 2016. 38 days. 'Easy' snow climb. 6th highest mountain in the world. There is probably no better preparation for climbing Everest. Most accessible of the world's "8,000 metre", 26,000 foot high peaks. Leaders Angel Armesto and Dan Mazur are extremely experienced, friendly, and teach you everything you need to know. Located beside Everest on the edge of the exotic Tibetan Plateau. Full Service Cost: $12,850, £8450, €9,850; Basic Climb Cost: $6650, £4350, €5050. Our teams reached the summit safely in 2010, 2011, 2012, 2013 and 2014 please see www.ChoOyuNews.com . Choose our fixed dates or New Flexible Date Option: arrive anytime at your convenience during April and May. 37. ISLAND TREKKING PEAK EXPEDITION. www.IslandPeakClimb.com - 22 days or 7 days (school only) in April, May, October or November: Nepal's most famous easy trekking peak. Trip includes a visit to Everest basecamp too. Leader Dan Mazur teaches you everything you need to know. Introduction to high altitude. Full Service Cost: $2950, £1950, €2250. 5 day option: $1350. Our team reached the summit safely in 2010, 2011, 2012, 2013, and 2014. Choose our fixed dates or New Flexible Date Option: arrive anytime at your convenience during April, May, October or November. 38. EVEREST BASECAMP WALK NEPAL: www.EverestBasecampWalk.com 18 days in April, May, October or November. Walk together with Everest leader Dan Mazur on wide snow-free trails through green terraced villages perched beside rapidly flowing rivers beneath the towering snowy giants of the Himalaya to Nepal's most famous and beautiful basecamp first climbed by Sir Edmund Hillary and Tenzing Sherpa; hike the scenic ridge of Kala Pattar with stunning views of Everest. Visit projects conducted by the Mount Everest Foundation for Sustainable Development, including the rebuilding of Nepal's oldest convent in Deboche, and the Everest basecamp biogas project in GorakShep. Your Sherpas Mingma and Yangjie are highly educated, were raised in this valley, have been to the Hillary School and attended university in Kathmandu. Their English is superb, they are friendly and gracious hosts, and as you walk together each day, they will explain every detail of the trek and answer all of your questions. REDUCED PRICE! - Cost: $1850, £1250, €1450. By the way, our recent Everest Base Camp walk was very succesful, interesting and fun. Please go to: www.EverestBasecampWalk.com and click on: 'Please view our new Everest Basecamp Trek video clips'. Choose our fixed dates or New Flexible Date Option: arrive anytime at your convenience during April, May, October or November. 39. EVEREST TIBET ADVANCED BASECAMP WALK: www.AdvancedBasecampWalk.com - Full Service Cost: $3,850, £2,350, €2,950. PRICE INCLUDES EVERYTHING FOR THE DRIVE ACROSS TIBET AND WALK UP TO ADVANCED BASECAMP: FREE SHERPAS AND FREE HOTELS. Please join leader David Obrien for an exciting and affordable 20 day walk in April or May, and a good chance to see exotic Tibet. View the latest news at: www.AdvancedBaseCampNews.com . Rustic, Medieval and Less crowded Tibet, with the best views of Everest in the world, much better than in Nepal. Made famous in 1924 by Mallory and Irvine. ***Everyone reached basecamp during our recent trek. Choose our fixed dates or New Flexible Date Option: arrive anytime at your convenience during April or May. 44. FREE-OF-COST NO-CHARGE SUMMER GLACIER SCHOOL: 20 June to 27 June. 16th Annual Free of Cost - No Charge www.CascadeGlacierSchool.org . Join Dan Mazur & friends to learn about mountain equipment, snow - ice climbing, camping, glacier travel. Then try for a 4200 metre high glacier summit. Heather Jennings uses her ascender to pull herself back to the surface during self rescue practice (Heather Jennings). Leaders Bill and Scott go through the hip-belay technique on a slope outside camp as Tracy looks on (Rick Eng). 45. MOUNT CHO OYU EXPEDITION. www.ExpeditionChoOyu.com August-September 2015 and April-May 2016. 38 days. 'Easy' snow climb. 6th highest mountain in the world. There is probably no better preparation for climbing Everest. Most accessible of the world's "8,000 metre", 26,000 foot high peaks. Leaders Angel Armesto and Dan Mazur are extremely experienced, friendly, and teach you everything you need to know. Located beside Everest on the edge of the exotic Tibetan Plateau. Full Service Cost: $12,850, £8450, €9,850; Basic Climb Cost: $6650, £4350, €5050. 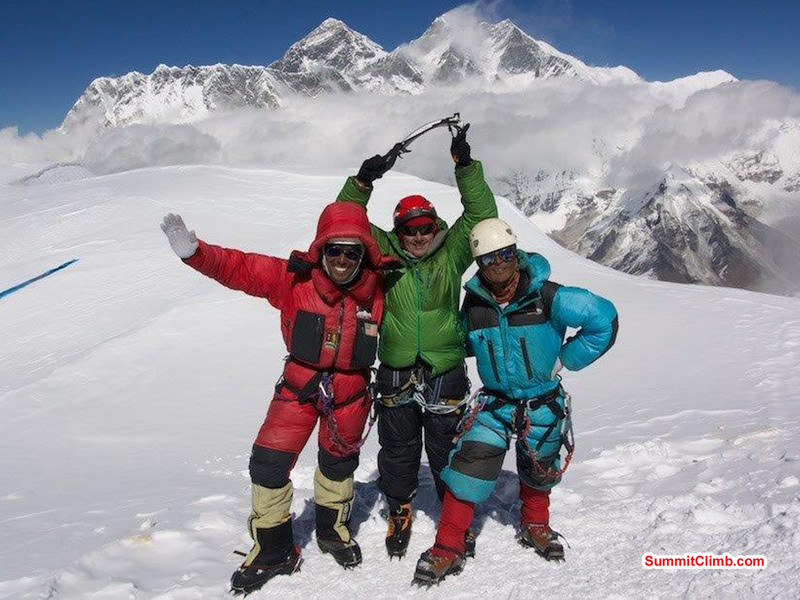 Our teams reached the summit safely in 2010, 2011, 2012, 2013 and 2014 please see www.ChoOyuNews.com . Choose our fixed dates or New Flexible Date Option: arrive anytime at your convenience during April and May. 47. MOUNT BARUNTSE EXPEDITION. 32 days in October-November 2014. www.BaruntseClimb.com . Remote Nepal at its best. This expedition offers something for experts and beginners alike. Grand Circle Traverse trekking and climbing trip, begins with Mera Trekking Peak as a "warm-up", then Baruntse: Nepal's 'easiest' 7000 metre / 23,000 foot high peak, superb preparation for Everest. Then we complete the loop by trekking and climbing over the famous and very beautiful Amphu-Labtsa Pass at the foot of Everest. Trip finishes in the famous Everest Valley with a three day trek to Lukla. Perfect ending to a very special circuit. Three peaks for price of one. Leader Dan Mazur: Excellent teacher will teach you all of the climbing skills you need to know. Our strong Sherpas are with you every step of the way. Full Service Cost: $8950, £5450, €6450. Our team reached the summit safely in 2010, 2011, 2012, and 2013. For the news please visit: www.BaruntseNews.com and please watch this well made 10 minute video by Richard Pattison: "Breathless on Baruntse"
48. MERA TREKKING PEAK EXPEDITION. 22 days in October-November 2015. www.MeraPeakClimb.com . Best views of Everest from this easy remote Nepal 6500 metre/21,000 foot trekking peak. Friendly Leader Dan Mazur teaches you everything you need to know about walking and easy climbing on snow. Perfect introduction to high altitude. Helpful expert Sherpas are there with you every step of the way. Full Service Cost: $3150, £2050, €2450. Our team reached the summit safely in 2010, 2011, 2012, 2013 and 2014. Please also read the news page www.MeraPeakNews.com . OPTIONAL: For those who are especially keen, you may wish to bring your skiis or snowboard (please watch the video on the news page).